The eyes are the most significant facial feature in a portrait. They convey so much of a person's feelings and personality. Portraitist Douglas Graves describes the best way to draw the eye below. In the three demonstrations that follow. notice that the artist used tone rather than line in rendering the steps. In a smudgy way, he attempted to convey the depth of the eye in the socket, the roundness of the lid, and the dark presence of the pupil. 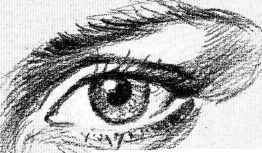 To suggest sparkling eyes, try a black carbon pencil on a middle-tone gray pastel paper. He next used white pencil to develop the planes further and to establish the whiteness of the cornea. 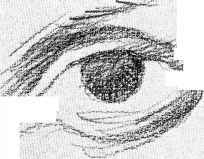 He also indicated which would be the lightest areas (such as the corner of the eyelid) and which the darkest (in this case, the pupil). In the final stages, he strengthened the values, darker or lighter, and then added details and highlights. 1. Using a B pencil, the artist started the eye by smudging in a round, darkish cornea, around which he would later build the rest of the structure. Here the upper lid rested right on the cornea, actually covering about a quarter of it. The artist molded the lower lid in a deep curve, forming the boundary between the eye and cheek. Both of these lids were shaded to suggest the circularity of the eyeball underneath. The eye was also shaded near the bridge of the nose and at the outer eye corner. A few quick lines already show where the eyebrow will lie. 2. First, the artist established the tonal spectrum—using the darkest black in the pupil, and white pencil in the cornea. Next, he corrected some of the eye proportions. He raised the arch of the upper lid so that it just touches the outer limit of the pupil, which is about half the area of the whole cornea. An attentive, alert eye will have this arching shape. Also, he closed in the lower lid around the cornea and shaded in the eyebrow. 3. The artist used the tones of his spectrum to further define the eye. On the left side of the cornea, he used white pencil to emphasize the roundness of the eye. He left the right side the natural gray color of the paper, but he deeply shadowed the upper edge and outer corners of the lower lids. He heavily shaded in the crease above the upper lid and added lashes to both lids. He used long, outward-sweeping lines for the upper lashes, and short dashes for the lower ones. 1. As before, Douglas Graves started by drawing the cornea. He then sketched the lids and a suggestion of the nose. He indicated the basic tone of the eyebrow and positioned it close to the eyes to give a masculine appearance. 2. He established the extreme lights and darks, using white pencil and pressing hard with the black one. He accentuated the elliptical shape of the cornea and pupil and then sketched in straggly eyebrows, laugh lines in the corner, and wrinkles under the eye. Remember, this is the testing stage; if any element doesn't work well, it can be erased since it's so lightly sketched. 3. In this step, the artist just added emphasis to what he'd already drawn. He strengthened the gray and white tones along the front of the nose, in the eye corner, under the brow, in the sagging skin below the eye, and on the eyeball. Note that it doesn't take very much white shading for it to be effective; he added just a few scratches here and there in the corner and around the lower lid. The strongest areas of white are at the outer edge of the eye and on the cornea. He made the eyebrow even more scraggly-looking with a few well-placed lines, and left the lashes sparse, with just a few at the top and bottom. 1. The procedure is almost the same as for the front and three-quarter views, but since this was for a profile, the artist roughly outlined the brow, eyeball, and nose. This also was drawn as a man's eye. 2. Here the artist added tone to the sketch. Most of the structure around the eye is in shadow, especially the inner corner of the eye. He darkened the crease of the upper lid and rimmed the eye with lashes. Again, he used white pencil to add some fine wrinkles to the forehead, moisture to the lower lid, and shine to the nose. He drew wispy hairs into each eyebrow. 3. Because this was a profile view, the shadows were much darker, and so the artist shaded the drawing very heavily. On the side of the nose, he shaded around the form, giving it an illusion of smoothness. He blackened the brow hairs and tried to sketch as great a variety of hairs as possible: long, short, straight, and curly. Then he used the white pencil to turn some of the black hairs gray. The eyelashes were both black and light gray, with the lighter ones resulting from the peculiar lighting situation. He also used the white pencil to show drops of moisture in the nearest corner of the eye. The cornea was not at all white here; since it was so much in shadow, the artist actually shaded the cornea with black pencil. Remember that such shadows happen often, and darken, rather than lighten, the eyeball accordingly. Realize Your Dream of Becoming a Professional Pencil Drawing Artist. Learn The Art of Pencil Drawing From The Experts. A Complete Guide On The Qualities of A Pencil Drawing Artist. How to color gray eyelashes? What are the steps to draw an elliptical gauge arc with a pencil and paper? How to draw human eyes in three quarter view?